Many of the inhabitants of the cities of the inca state, were goldsmiths, masons and potters. They work almost entirely for the nobility, these people did not had to worry about food or clothing, as this was supplied to them from the collcas (warehouses) of the empire. The pottery was the art most developed by Andean cultures. Long before flowering Tahuantinsuyo Empire, the people of these regions worked clay for several thousand years. As well; when the Inca Empire was founded, there were already a large number of very experienced potters. The necessary clay for the manufacture of ceramic abounds in the Andes, it could find very fine clays around the city of Cusco. Although used many colors, preferred were black, white, red and orange. The Incas had preference for geometric designs, dominated by rods, diamonds, circles and triangles. The most common forms are the aríbalo and queros, although the latter were in the middle horizon and could also be found in metal and wood. It is known a variety of ways, both fine ceramics such as domestic undecorated. Conical base, containers with side handles, tripod pots, plates with handle and painted inside. Pottery was a fusion of the styles of local people with the style of Inca empire. Much of the Pottery Inca is known for its mass production. Archaeological finds show a tremendous amount of molds allowing them a standard of mass production. In the handcrafting the potter’s wheel is not used. The manufacture of ceramic Incas was more simple, most potters molded his work with his hands, in other cases the clay was placed on a round plate which was then set to rotate; to obtain a finer finish, the Inca potters used smooth stones. Another way were to sink stones and molds against the lump of clay, on a metal plate. Most of Inca pottery was utilitarian and domestic, but also was ceremonial; that was used in celebrations and religious rites; this was especially decorated for this function. The Inca pottery was decorated with numerous designs and motifs, including cats, snakes, birds, jaguars, alpacas, llamas, bees, butterflies, geometric designs; also with human forms and mythological beings. All crafts of the empire had something in common, although the designs varied from one village to another, it was possible to identify to which village belongs a determined ceramic. 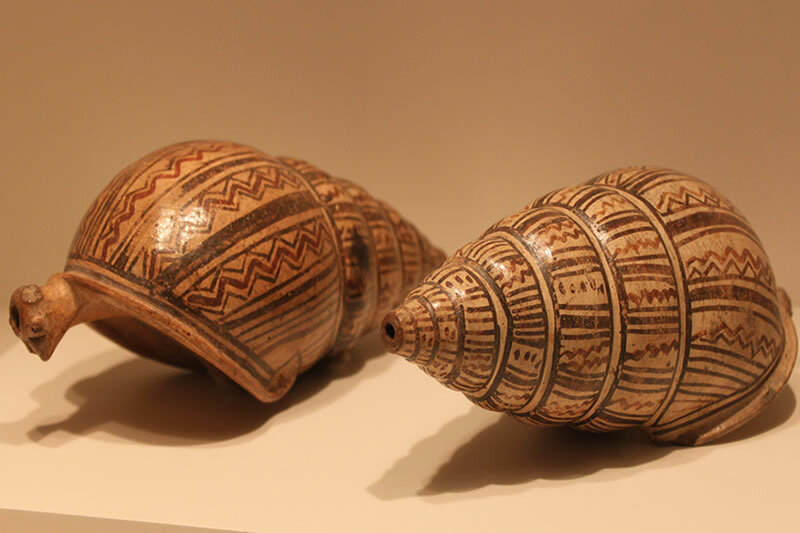 The first derivatives of the Chimu Culture with reminiscent of the Mochicas, very noticeable on ceramics glossy black color, made by potters in the northern coasts of the empire, exactly at Chanchan and Lambayeque. It presents handles like a stirrups of fine finish, with motifs zoomorphic and anthropomorphic. However, the ceramic produced in mass was of lower quality. In the second stream, one can see a greater degree of originality, the Incas and designs are clearly different from any other. It is suggested that these potters were from Nazca, established at higher elevations. The pottery is characterized by the introduction of a new form, known as aríbalo, were globular jars elongated neck. The inca pottery with two handles on the sides of her swollen body. At the base of the neck it has a bump or button with forms of human or feline heads. Its base is tapered, so it must be seated in a hole or hollow in the ground, to keep it stationary. This form facilitates tilting to pour its content and avoid being damaged when it back to its original position. Like amphoras of classical antiquity. The Aríbalo was used to transport water and other liquids. The Quero (or kero), was a ceramic of the Inca Culture, a kind of glass that is used to drink liquids as traditional chicha of jora. It was also made of metal or wood, and was used in celebrations and Andean rituals. The Quero was used as a ceremonial vessel, the people of the Tiwanaku and Inca culture in important religious celebrations. They were hand painted and decorated with precious stones. more domestic versions were widely used in different Andean cultures.